Under the Affordable Care Act the federal government is granted the authority to offer health insurance premium subsidies (also referred to as advanceable tax credits) on a sliding scale to help individuals and families afford health insurance. Insurance premium subsidies are only available for plans purchased on the Federal Health Insurance Marketplace, or one of the state-run health insurance exchanges established under the Affordable Care Act. Purchase a health insurance plan on a state-run exchange of the Federal Health Insurance Marketplace AND have an annual household income between 100% and 400% of the Federal Poverty Level, as established by the 2016 Federal Poverty Guidelines. 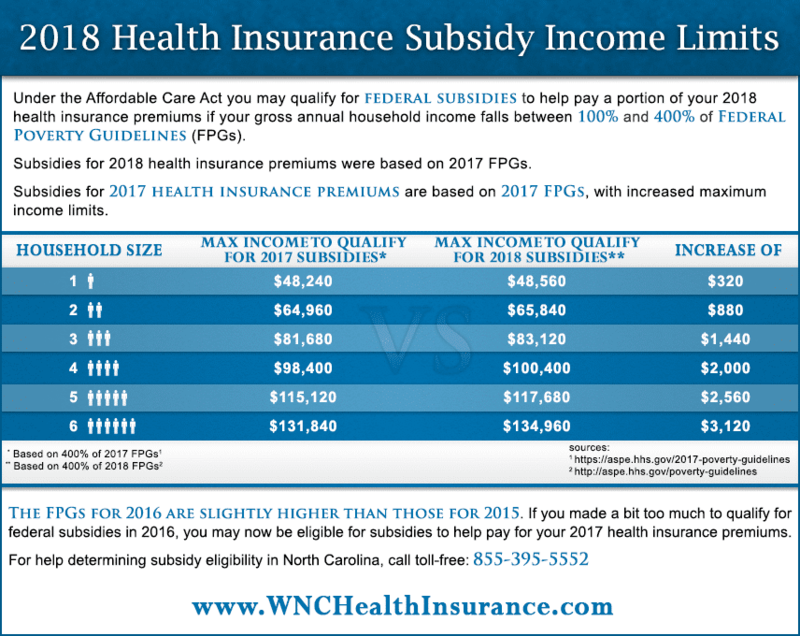 The 2017 Federal Poverty Guidelines, which determine 2018 insurance premium subsidies, are higher than the 2016 FPGs, which were used to establish insurance premium subsidies in 2016. That means, if you made slightly too much to qualify for subsidy assistance in 2017, you may now be eligible to qualify for subsidies in 2018.